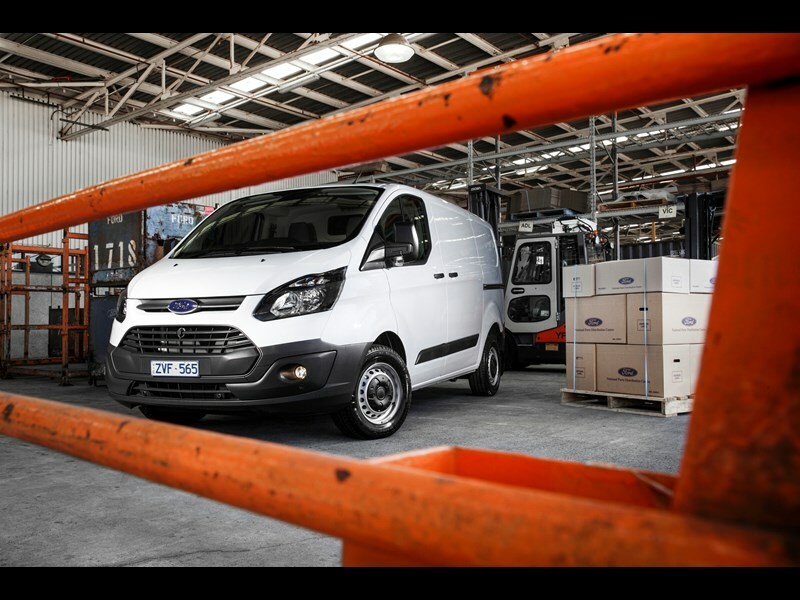 Ford Australia has launched two new Transit models as it leaps back into the one-tonne light commercial vehicle fray. The Transit Custom is currently available in two different versions: the short wheel base 290S and the long wheel base 330L. This gives the 290S a load area of six cubic metres while the larger 330L comes to the market with 6.8 cubic metres. As a new platform there is a striking visual difference between the new model and the outgoing boxy design. According to Ford, the Transit now looks like a member of the Ford global family with its 'Kinetic' design mirrored across much of the Ford range. The Transit features rear barn doors as standard to enable easy forklift access and a single sliding door on the left of the van is standard. The Transit also uses a steel bulkhead between the cockpit and load area, while a floor protection layer has been added to the rear to fight wear and corrosion. An interesting feature on the Turkish built van is the built-in fold up roof racks that flip up and lock into place. The rack also has a load capacity of 130kg. A flip-up door has been installed in the bulkhead to allow long items to protrude into the storage area under the two passenger seats. Furthermore, there is enough room for two Australian sized pallets down the centre of the load area. Engine wise, the Transit uses a 2.2 litre Duratorq turbo diesel engine with a power rating of 92kW and 350Nm. Power is fed to the front wheels via a six-speed manual transmission. At this stage the transit is manual only. Ford will not be drawn on the possibility of an automatic version other than stating that it is something it will be pursuing in the future. Ford is also enthusiastically promoting the fuel economy of this powerplant, claiming a combined fuel economy figure of just 7.1litres/100km. A full suite of safety features including dynamic stability control, traction control, hill launch assist, trailer sway control, load adaptive control, rollover mitigation and torque vectoring control are standard. Six airbags also protect the occupants in the advent of a crash. Ford’s emergency sssist function automatically dials 000 if it detects a collision. ATN took both models for a drive recently and delivered food for the homeless and disadvantaged at the same time. The new cockpit is extremely well laid out and makes the Transit very car-like to drive. Visibility is excellent due to seating position and rake of the windscreen. Lrge side fold-in side mirrors help when looking backwards. The Duratorq powerplant is delightfully torquey even when loaded and only really sounds coarse at low rpm. The Transit’s turning circle is also surprisingly tight for a front wheel drive van and the whole package is very smooth and quiet out on the open road. Pricing for the new Transit models is $37,490 for the 290S and $39,490 for the 330L . The Transit Custom will also be available with a factory warranty of five years or 200,000 km for a limited time. Find Ford Transit vans for sale.